This authoritative guide—based on the author's classic reference work, Indian Herbalogy of North America—is a portable illustrated companion for the professional and amateur herbalist alike. 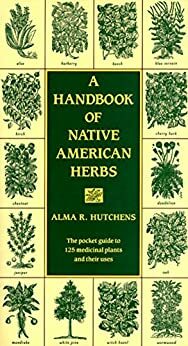 It provides detailed descriptions of 125 of the most useful medicinal plants commonly found in North America, along with directions for a range of uses, remedies for common ailments, and notes on the herbal traditions of other lands. Entries include staples of folk medicine such as echinacea and slippery elm as well as common kitchen herbs—such as parsley, thyme, and pepper—whose tonic and healing properties are less widely known. While the book is stuffed with great information, the illustrations are lacking and few. I wish they would do a reprint of this book with more and even color illustrations. I'd pay a bit more for that for sure. As of now, I'm uncomfortable foraging with this as my handbook because I just don't know what things look like. I am working with a Master Herbalist who is training me and this is one of several books recommended to me that I have purchased. The art of herbal remedies is a whole new world that is essential for anyone considering or now living off grid. I have gained so much knowledge in such a short time, and I have connected with local dealers that are purchasing bulk products that grow wild on my property. This same review applies to all of the herbal books I have purchased, I don't just recommend one but all of them for your library as a serious or novice herbalist!!!! 4.0 颗星，最多 5 颗星Pretty impressive book . Covers a huge amount of herbs ! Pretty impressive book . Covers a huge amount of Native American herbs . Fairly thorough . Not a lot of info on each herb but a good amount . About what one would expect from a handbook .What this lacks and most books like this do . Is clear images . But I guess that would make it much more expensive and much larger in size . One can always look the images up online using Google image search . 2.0 颗星，最多 5 颗星Not as good as "Indian Herbalogy of North America"
Not as good as Indian Herbalogy of North America. This one leaves out many plants and the information & dosing is missing. 3.0 颗星，最多 5 颗星If you don't have the other book this is an excellent resource. is a smaller version almost word for word from other book I ordered called The Indian Herbalogy of North America This was disappointing as i ordered one for myself and another for a friend who already had that other book. If you don't have the other book this is an excellent resource.